What have Alanis Morissette, Diana Ross, Chaka Khan, Stanley Clarke, James Ingram, Kirk Whalum, George Duke, Take 6 and Josh Groban in common? Keyboardist Mark Stephens has performed with them on many concerts. He also wrote songs for Boney James like All Night Long, Butter, Cry and There and Back. Nevertheless Mark shares with many musicians the fate to stay in the shadows. With his upcoming album The Dream Of The Peaceful Warrior (2011) it's time to walk into the limelight. This star-studded project is featuring Chaka Khan, Andrae’ Crouch, Take 6, Kirk Whalum, Jonathan Butler, Marcus Miller, Boney James and the late, great Michael Brecker and has certainly the potential to make Mark popular. The piano study Prelude invites the audience to Stephens' first opus The Light Of Love. This piece is spiritualized by world renowned vocal sextet Take 6 and also features Mark's impressive mini moog solo in the style of George Duke. Karen Berond allures with Groove Junkie. Marcus Miller shines on fretless bass and bass, while Walt Fowler excels on trumpet with a superb solo. Vision Quest follows the path of NY super group Steps Ahead with the excellent support of Walter Fowler on trumpet and the late Michael Brecker on saxophone. Apaixonado means "in love". This Brazilian love song features singer Rogerio Jardim. While Rogerio's voice caresses your ear, don't miss Mark's excellent piano improvisations. John Lennon's century's master work Imagine is perfectly interpreted by singer Quinn and arranged by Fred White and Mark. A divine gospel piece. See in your mind's eye Sseesamirembe, the ideal African flavored dream. On the shore of lake Victoria the Andrae Crouch Singers build a city for living in peace. When somebody can incorporate Africa in his vocals with greatest authenticity, then it is Jonathan Butler. This South African rooted singer performs on Renewal his soul. Melvin Lee Davis' fretless bass and Rogerio Jardim's vocals fuse to an appealing sound on Peaceful Warrior. But the hero of this tune is without any doubt Mark Stephens showcasing what is possible on keys these days. Mick Taras is firmly rooted in Rock music. So he brings an edgy note into The Security Council. Contemporary Jazz and Rock, Taras on guitar and Mark on Rhodes. Exciting! On Dark Secrets Stephens performs with elegance silky contemporary jazz. The Martin Luther King Jr.-inspired To the Mountaintop presents anew Stephens on piano in brilliant condition. Although this is a collaboration between Boney James and Mark, Boney's sax melts with Walter Fowler's trumpet to a strong horn segment. The album closes with the funky Stand Up, the antipode to the Prelude. Who can represent this state of mind better than the legendary Chaka Khan. With fervent conviction she summons to defend themselves. 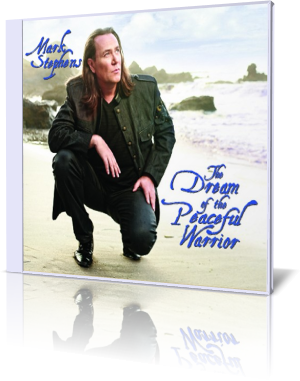 Mark Stephens created The Dream Of The Peaceful Warrior with an unbelievable passion. Tightly packed with top notch musicians this album shines with an enormous energy, that I call: "Come on, man. Play it one more time!"